Continuing with my collection of Travel Intro Styles, I am adding also a separate slide style for the United States. 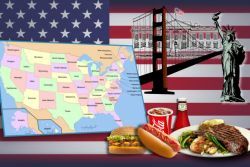 The slide starts with an animation of the flag of the US, followed by graphics of the US landmarks and popular food, and the map. This style is extremely easy to use. In fact, there is nothing for you to do, except to apply it in your show. Lucky me, we just got back from Switzerland and Italy trip and found your templates. Perfect! Now, I just wish you had South America (Patagonia) and Cuba, to cover last year's slideshows I'm still working on! If I get more requests for these destination, I'll most certainly make the styles.